What do you do and where are you from? Currently pursuing a bachelors degree in mass communication. I am from Nagaland. I always have a rucksack on standby. I’m leaving for a new place any opportunity I get; I’m on a quest to become a true vagabond. I remember always wanting to be in a band. Kind of like a Woodstock attendee. I also like layers. Jeans and sweatshirt from H&M, oversized t-shirt I got stitched, and supra shoes. Maverick from Top Gun and Jimi Hendrix. A song you’re currently listening to on repeat. “You get it?” Because I’m always on lookout for validation and reassurance. 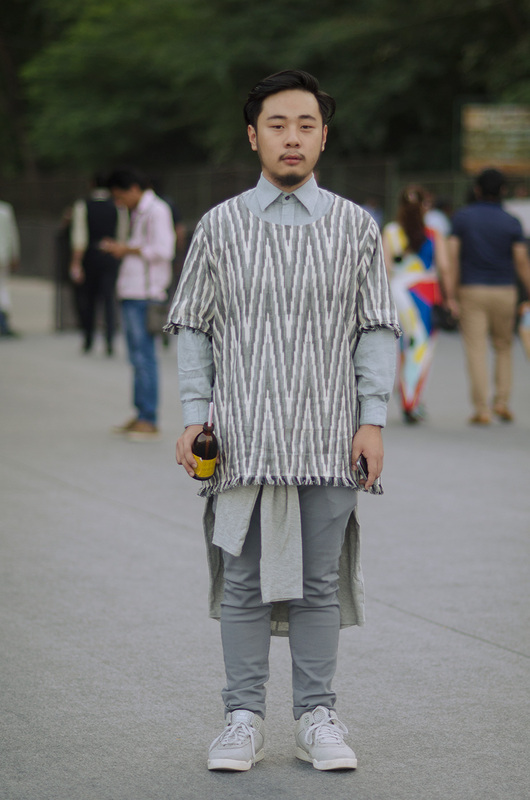 Fashion week, Delhi. October 2015. This entry was posted on October 22, 2015 at 11:10 and is filed under India. You can follow any responses to this entry through the RSS 2.0 feed. You can leave a response, or trackback from your own site. Your blog is interesting. I love it! Its so different. You are very creative and different,totally loving it.